Speculation that the Conservatives are planning tax rises, if they win the general election, have been played down by party sources. 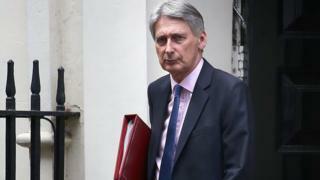 Chancellor Philip Hammond said on Thursday there should be "flexibility to manage the system" of taxation. But Tory party sources have told the BBC it was not a hint at plans to raise taxes in the Conservative manifesto. The shadow chancellor John McDonnell accused the government of planning "a tax bombshell". And the Liberal Democrats suggested Mrs May intended to hit the pockets of the "white van man". Before winning the 2015 general election, the Conservatives promised no rises in VAT, national insurance contributions, or income tax. The American revolutionary Benjamin Franklin said the two great certainties were tax and death. And certainly commitments to push tax rates up can prove fatal to political campaigns. Philip Hammond criticised the constraints placed on him by his party's previous pledges not to raise income tax or national insurance. But now Conservative insiders are emphasising that does not mean the forthcoming manifesto will automatically abandon this position. The content of the document is yet to be agreed - but the swiftness of the response suggests that headlines in some Conservative supporting newspapers, speculating on tax rises, were far from welcome. On Thursday, Mr Hammond told the BBC's Kamal Ahmed that "we do need to make sure that Theresa May and her government have a clear mandate to execute our plan". "All chancellors would prefer to have more flexibility in how they manage the economy and how they manage the overall tax burden down [rather] than having to have their hands constrained," he said. "But what we put in the manifesto will be decided in the next few days and we will publish that." Shadow chancellor John McDonnell said the chancellor was facing a £2bn gap in his budget following the government's decision not to carry out an increase in the rate of National Insurance contributions for the self-employed. "He's recognising he's got problems in the economy, he's got problems in the budgeting that he's done and as a result of that there will be tax rises under a Conservative government if they are re-elected. "This is quite a tax bombshell." Meanwhile, the prime minister said on Friday that the commitment to spending 0.7% of national income on international aid "will remain" although it must be spent "in the most effective way". It follows speculation she was ready to drop it from the Tory manifesto. But Mrs May declined to guarantee existing spending on state pensions, which ensures a minimum 2.5% annual increase.